In 2007, PFCA+P were commissioned to undertake a built heritage assessment of the buildings that comprised the ‘Heritage Square’ precinct in central Hobart. That precinct subsequently became known as ‘Parliament Square’, and a development proposal was advanced for the Square. This proposal required the demolition of two listed buildings; the Government offices at 10 Murray Street, and the former Tasmanian Print Authority building at 2-4 Salamanca Place. 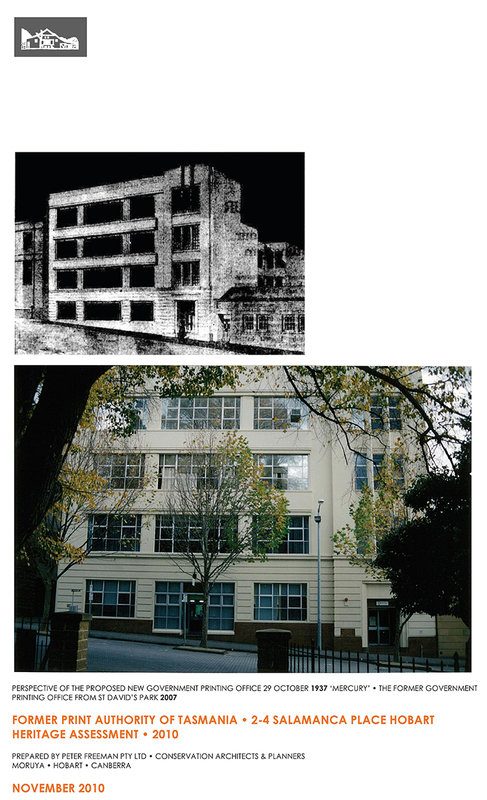 Peter Freeman has been involved in the campaign to retain both listed buildings and has had a particular interest in the potentials of the former Print Authority building [entered on the Tasmanian Heritage Register] to be adaptively reused.